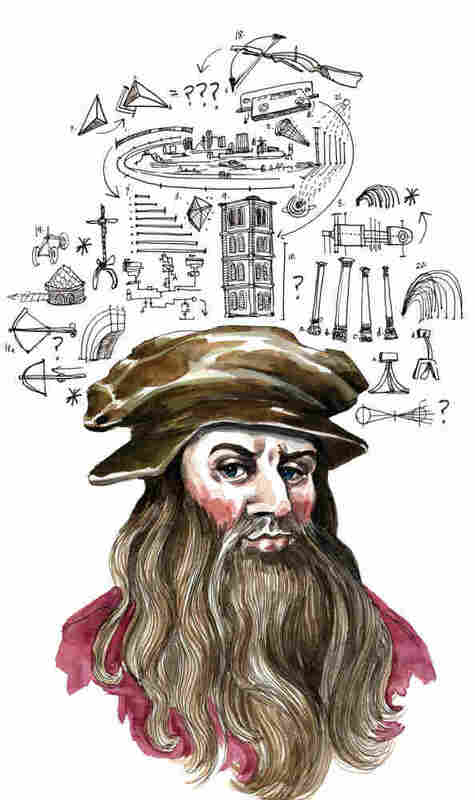 Leonardo's To-Do List : Krulwich Wonders... "It is useful," Leonardo da Vinci wrote, to "constantly observe, note, and consider." But when you are Leonardo, what sorts of things are buzzing around in your head? Here's something you can't do every day: How about you and I slip into Leonardo da Vinci's head for moment? Deep in. Thanks to historian Toby Lester, we can. 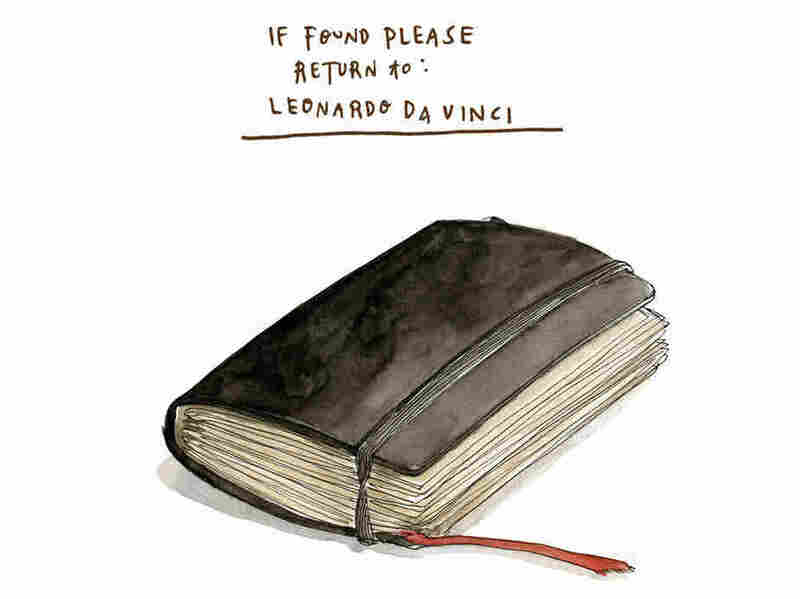 In a book soon to be published, Lester says Leonardo used to travel with a small notebook hanging from his belt, and "whenever something caught his eye," he would make a note, or begin "sketching furiously." "It is useful," Leonardo wrote, to "constantly observe, note, and consider." But when you are Leonardo, what sorts of things are buzzing around in your head? Well, Toby Lester describes what is essentially a "To Do" list buried in one of those notebooks, a bunch of things Leonardo planned to do one week, or month, in the early 1490's. I know what my To Do list would look like, and it would look nothing, not even remotely like this one. What a jumble! Cannons, wall construction, studying the sun, ice skating in Flanders, optics, and that oh-so-casual, "Draw Milan." It's like his mind could wander off in any direction at any time. How did he concentrate? How did he focus? Maybe he went in and out, plunging into a task that concentrated him fully, and then, once done, he'd spring back to the rough and tumble of Anything Goes. Great minds can go as they please. Another giant, Michel Montaigne, the inventor of the essay, wrote that no single idea could hold him. "I cannot keep my subject still," he wrote. "It goes along, befuddled and staggering, with a natural drunkenness." I like being drunk like that. "We live in an age that worships attention," says my friend (and Radiolab colleague) Jonah Lehrer. "When we need to work, we force ourselves to concentrate. This approach can also inhibit the imagination. Sometimes, it helps to consider irrelevant information, to eavesdrop on all the stray associations unfolding in the far reaches of the brain." That ability to let go, float free, does seem like an essential part of a creative mind, not just in giant ones. Those of us who make our livings closer to the ground, have to do it too. In his forthcoming book, (coming to bookstores this Spring) Jonah mentions a study by Dr. Holly White, then at the University of Memphis, and her colleague Priti Shah, of the University of Michigan. They recruited 60 undergrads, half of whom were diagnosed with attention-deficit hyperactivity disorder (ADHD). So these kids had real difficulty focusing and sticking to any one activity. All the students were then given a variety of creativity tests (including the Creative Achievement Questionnaire, originally developed by Shelley Carson at Harvard) and, surprisingly, the ADHD students generally got higher scores. When White asked, "Who among you has won a big part in a play, an art prize, a science prize?" — who has been recognized for his or her achievements out there in the real world — again it was the ADHD students who had done better. Minds that break free, that are compelled to wander, can sometimes achieve more than those of us who are more inhibited, more orderly, the study suggests. Or, as Jonah chose to put it, there are "unexpected benefits of not being able to focus." The other element, of course, is stubborn curiosity. Leonardo, that icon of a Renaissance Man, wanted to know everything. On one page of his notebooks from the early 1480's, you can see he has gotten a new pen and he's just doodling, testing it out, and as his mind wanders free, what does he write? Says Toby Lester: it's a riff on the phrase "Dimmi" ("Tell me"). Leonardo jots the words, "Tell me...tell me whether...tell me how things are...tell me if there was ever." These, says Lester, "are the tics of an increasingly hungry mind." Toby Lester's new book on Leonardo hits the book stores in February. It's called Da Vinci's Ghost: Genius, Obsession, and How Leonardo Created the World in His Own Image (Free Press, 2012); Jonah Lehrer's book also has a 2012 release. His is called Imagine, How Creativity Works (Houghton Mifflin Harcourt, 2012). And, yes, both Wendy MacNaughton, whose wonderful drawings illustrate this post, and I know that Leonardo wrote Italian from right to left, as in Hebrew or Arabic. We decided to set his prose in the ordinary way to make it easy to read, but purists can always grab a mirror and see it like the original.